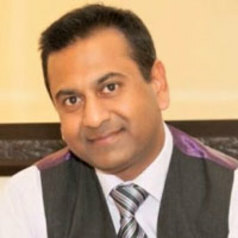 Professor Vikash Sewram is the Chairperson of the Ministerial Advisory Committee on the Prevention and Control of Cancer in South Africa, the Founding Director of the African Cancer Institute and Professor of Community Health at the Faculty of Medicine and Health Sciences, Stellenbosch University, South Africa. He obtained a PhD degree in Medicinal Chemistry and Physiology from the University of Natal in 1998, an MPH in Cancer Epidemiology (with distinction) from the School of Public Health and Family Medicine, University of Cape Town, in 2002, and a PhD in Public Health: Cancer Epidemiology from the same university in 2007. In 2009 he was nominated to the Academy of Science of South Africa and, in 2014, to the Permanent Scientific Committee in the Oncology Section of the World Organization for Specialized Studies on Diseases of the Esophagus. He has spent time abroad as visiting scientist at the International Agency for Research on Cancer in Lyon, France; School of Public Health, University of Michigan, USA; and the Cancer Council NSW in Sydney, Australia. His research achievements have earned him 10 national and nine international research awards, and have resulted in numerous national and international collaborations, peer-reviewed publications, research grants and postgraduate student supervision.